You must be an administrator on the computer where you want to install Office 365, Office 2016, or Office 2013. 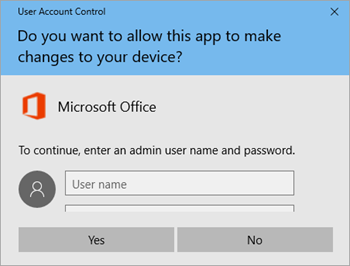 If you're not already an admin, when the User Account Control windows appears during the Office installation, a person with administrator rights on your computer must type in their admin username and password, and then select Yes for the installation to continue. How you check if you have administrator privileges on your computer and what to do if you don't, depends whether or not your computer is joined to a domain. Open the Control Panel and then select System and Security > System. At the bottom of the View basic information about your computer section, if you're joined to a domain it says, Domain: and lists the name of the domain you're joined to. If you're not joined to a domain, it says Workgroup: and indicates name of the workgroup your computer is part of. Select Start, and type Control Panel. In the Control Panel window, select User Accounts > Change your account type. Make sure Administrator is selected. If you can't select the Administrator option, contact the person who has administrator rights on your computer and ask them to give you admin privileges, or have them type their administrator username and password when asked for it during the Office installation. In the User Accounts window, select Properties and then select the Group Membership tab. Select Start, and select Control Panel. In the Control Panel window, select User Accounts and Family Safety > User Accounts > Change your account type. In the Control Panel window, select User Accounts and Family Safety > User Accounts > Manage User Accounts. In the User Accounts window, select Properties and the Group Membership tab. In the Control Panel window, select User Accounts and Family Safety > Change your account type. In the Control Panel window, select User Accounts and Family Safety > Manage User Accounts.